Balancing exercises, hand-over-hand exercises or a combination with other fixed equipment helps create fun obstacle courses. Increase areas of utilisation by adding accessories such as Climbing Nets, Beam Bars, Mats, Horses and Benches. Beam systems are subjected to a great deal of strain and require a high degree of quality and safety. The wooden details in our beam system are made of glued finger joints, while the height-adjustable activity beams are made of solid wood. The surface is varnished twice to ensure comfort and durability. All of the steel details at the ceiling are white varnished, RAL 9016, in order to blend in with the ceiling. We believe our model is the strongest and most durable available. We want our equipment to have a long and safe lifetime. The Rantzows Beam System is made from finger-jointed timber. The elevator only activity booms are made of solid wood. The surface varnished in two rounds to become comfortable and durable. All models can be installed to suit a ceiling height of 3.5 meters and up. Please contact us to discuss your requirements. The V300 model can be installed in most gymnasiums and is the most useful beam system model. Two wooden height-adjustable activity beams and three special wooden poles, two of which are movable, allow for several different set-ups. Can be combined with all types of accessory equipment. Complete set including steel rails for the ceiling. Varnished with RAL 9016. Similar to V300, except that V250 only has 1 adjustable wooden beam. 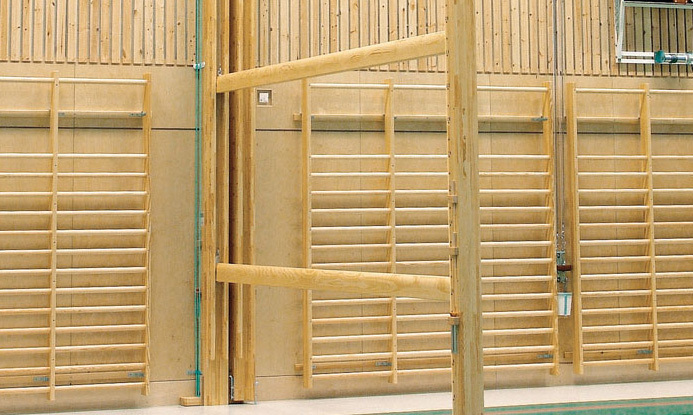 V200 is our simplest beam system; it is particularly useful in very small gymnasiums with space for only a few pieces of equipment. Consists of 2 wooden height-adjustable activity beams and 2 outer poles, one of which is movable. Similar to V200, except that V150 only has one height-adjustable activity beam. V150 offers the least flexibility, but is an excellent model for simple exercises.